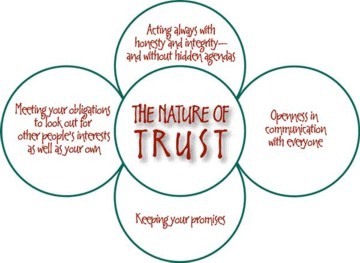 Following immediately from essay 266 is an attempt to explore the concept of trust. While I agree with Umar ibn Al-Khattab (to the right), my reporting of Chinese cultural behaviour is automatically of concern. see essay 88. 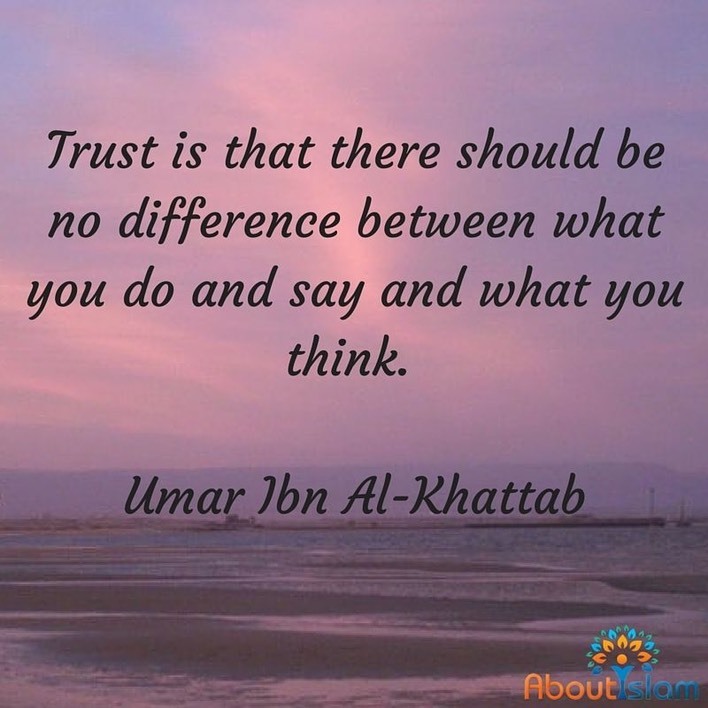 Trust is the belief that someone or something will behave as predicted. Buried within that idea is a history of consistent behaviour making the thing or person worthy of trust. Inside our heads we predict how the world will behave and a person worthy of trust is one whose behaviour is consistent with that image. For most of us, that reduces down to the expectation that what they say and what they do line up; the degree of fit is close to the level of trust given. You might, as  does, distinguish between an emotional trust, where you expose vulnerabilities but trust no advantage will be taken, and a logical trust, which is the predictable behaviour model. There are some other occasions where we exhibit trust, such as that trust which occurs in dealing with strangers in some sort of value exchange. I have a man coming to do some work on the house; he is trusting that i will pay up as I have promised, as I am trusting that his work will meet the expected standard. Within that deal is a trust lying in the delay between the start and finish of that interaction, which might be called trust now, a recognition that one is exposed to liability, that one is being asked to be worthy of trust. In other words, that expected behaviour occurs. I see this as an early stage of logical trust. Similarly there is an element of emotional trust here in the sense that one or both sides are exposing a vulnerability. The extent of trust reduces to measuring the possible damage—harm might be a better word—if the other party does not behave as expected. Hence phrases such as “I’d trust them with my life”. 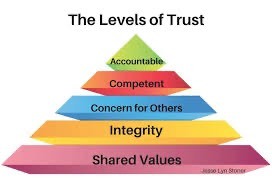 Source  says trust is built from the five Cs: Competence, Care, Consistency, Chemistry and Candour. I hope to garner more from this source. Source [5, wikipedia,] covers this with its usual thoroughness. Among the points made is one of competence: A failure in trust may be forgiven more easily if it is interpreted as a failure of competence rather than a lack of benevolence or honesty. At the point of failure what is suddenly important is honesty trust - trust that the parties involved in the failure will be honest.. Many sorts of trust, such as trust in institutions, would be better called institutional confidence. Example; following our debacle with the Home office in 2017, we no longer have the same level of confidence in our state institutions. Source , Researchgate, tends to look at trust in the context of employment and leadership. Hence it use phrases such as trust is a performance multiplier. As one correspondent from the Novel Group of Institutes put it, Trust certainly is a performance multiplier in an organisational situation. 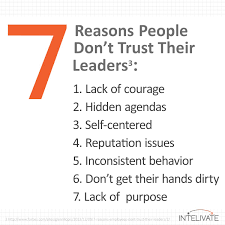 There must be mutual trust between leadership and employees for implementation of strategic decisions. The organisational culture, which is build up on mutual trust, empowerment and participation, is the culture of performance. These two cycle diagrams are from the Guru Jambeshwar UST. I couldn’t make them any clearer. I copy them becas†ue I agree with the content. One contributor to the comments at the researchgate site is of the opinion that in education and research (which may be the same in his view) the watchword was dubito, ergo sum. I don’t see that as a failure of trust; a researcher can report what occurred and still be in error as to the conclusions made. That does not make them untrustworthy. The conclusion here that I find valid is that in research, trust is not a performance multiplier, with which one can agree. So why do we place any trust at all in pour politicians? I conclude that we don’t do this at all, we simply hope they can fulfil some of their declared objectives. In general the perceived behaviour of politicians is that they don’t deliver, so they fail in trust because their words do not tie up with their perceived actions. We don’t go look how they voted on an issue, we look to see whether they produced a result that affects us for the better. So the trust is at a party level in many ways. Given the current situation where both major parties are divided within themselves, we have little hope of either party making changes inline with their declared preferences (on any issue at all, since politics doesn’t do one thing without it being connected to several others)). That leaves us looking for institutional honesty - we look for Parliament to be self-regulating. Thanks to the 2009 expenses scandal, this too was damaged, - so we are in a bad place. I found many books on trust and political trust. Most wanted more than £20 before I could decide if was prepared to read the work, so I did without. My loss, but I could easily have spent £100 producing better comment.